Authorities are expected to hold a news conference at 9 a.m. to provide updates on a search for a fired LAPD officer who went on a deadly rampage across Southern California, killing three people and wounding two since Sunday. Law enforcement officials searched the ski resort area of Big Bear Thursday after discovering the burned truck of Christopher Dorner, a former officer, who outlined his plans to target law enforcement and their families in an online manifesto. The search prompted the shutdown of Bear Mountain and Snow Summit and some of the schools, but the resorts were scheduled to reopen on Friday. The closures were prompted by door-to-door searches for Dorner after authorities found his truck on a forestry road. Schools in the Rim of the World and Bear Valley Unified districts said campuses will remain closed Friday. 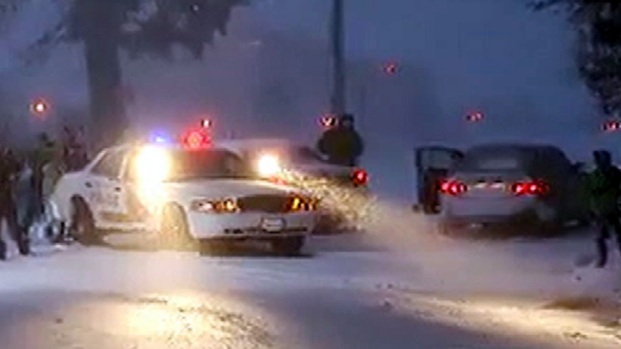 Officials cannot say for sure that Dorner is no longer in the area after an overnight manhunt. Residents were warned not to open their doors for anyone unless they know them or they are uniformed law enforcement officers. Authorities found Dorner's truck about 2:30 p.m. and used the vehicle identification number to confirm it belonged to Dorner, San Bernardino County Sheriff John McMahon. "Our thoughts and prayers are with the families of officers injured and killed this morning," McMahon said. "It's truly a sad and tragic day in all of law enforcement." Deputies, assisted by local, state and federal police and forestry experts, combed through neighborhoods in the mountain community 100 miles east of LA as sunlight faded and cold set in. Snow was expected through Saturday. Additional deputies were detailed to patrol the area around the clock to "make sure the community's safe," McMahon said. Extra officers were also posted at the bottom of the mountain on highways 18 and 330, checking vehicles coming down and going up, he said. Deputies will search until they either capture Dorner or determine he's no longer in the Big Bear area, McMahon said. "He could be anywhere at this point," McMahon said. "That's why we're searching door to door. "We're doing everything we can to search the area in an attempt to find him." The burned-out carcass of the truck was first reported about 8:30 a.m. Thursday in the 2000 block of Club View Drive south of Big Bear Lake, near Bear Mountain ski resort. Nearby schools were placed on lockdown about 12:30 p.m., according to the Bear Valley Unified School District. "Due to an ongoing law enforcement investigation in the Bear Mountain area, we have made a decision to keep all of our students at our school sites until a parent and/or guardian is able to pick them up," Superintendent District Kurt Madden wrote on the district's Facebook page earlier in the day. SWAT officers were dispatched to the area as a precautionary measure, said Jodi Miller of the San Bernardino County Sheriff's Department. Aerial video showed a pickup truck that was charred, making it difficult to distinguish its original color. Dorner was last seen in a gray or dark blue Nissan Titan with California license plate 8D83987. Authorities also put out an alert for plate number 7X09131 linked to Dorner. Irvine police said a vehicle similar to Dorner's was found with its plates stolen. The truck, called a "vehicle of interest" in the Dorner investigation, was searched for evidence and prints at a San Diego County Sheriff's Department substation in Poway. By late-afternoon in Big Bear, Dorner's truck was towed to a command post for inspection. Dorner is accused of fatally shooting a newly engaged couple in Irvine on Sunday as part of a revenge plot against law enforcement. One of the victims was the daughter of Randal Quan, LAPD's first Asian-American captain who was mentioned by name in a manifesto apparently written by the disgruntled Dorner. Dorner also allegedly shot at four police officers early Thursday morning in two separate encounters. One officer was killed and another severely wounded. In between the two shootings, the suspect was likely in San Diego, according to police. An LAPD badge along with Dorner's photo ID were discovered by a shuttle driver near the city's airport, and a man meeting Dorner's description attempted to boatjack a 42-foot sundeck cruiser from a San Diego yacht club at about 10:30 p.m. Wednesday. Correction: An earlier version of this story erroneously reported that a badge found in San Diego was that of Dorner's. Police discovered a photo ID belonging to Dorner and an LAPD badge that's authenticity and original owner were unclear. This story has been updated.